Note: This scenario has been updated from its exclusive version for public release. 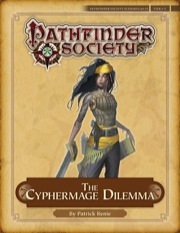 Purchasers have access to both the exclusive version released as Pathfinder Society Scenario #3–EX and Pathfinder Society Scenario #4–15, but as of February 28, 2013, only the latter is legal for Pathfinder Society Organized Play. Except for minor editorial changes, both versions of the scenario are the same; only the legal version of the scenario contains a Chronicle sheet. I thought it should be an investigating scenario in Riddleport, but not at all. Delve into a city of smuggler to hunt a bad guy. We kick the door, defeat her minions to ask where she is, then kill her. I wonder why it can be an EX? The only strong plot is the BBEG's tactic, need PCs to use their brain, not just kill all. I played this one a while back and didn't care for it. But then I GMed it and my opinion changed. I have run this scenario twice now and I really love it. Even though the encounters are all pretty well set, an experienced GM can allow for a more sandbox approach to the investigation. The scenario provides three suggested NPCs that your players can use to get information. Use these. And use more NPCs if you need to. If you can get your hands on the map of Riddleport with a key (Pathfinder #13) then you can give that to your players during the investigation. Let them roam the city and have some fun RP encounters. The mission is straight forward, but involves a bit of investigating to accomplish. The city where it is set is really fun, and provides opportunity for a ton of roleplaying. There is the complaint that is often repeated: it is difficult to accomplish both the primary and secondary goals for this scenario. I only personally know one group who has done so (and that was the group that I ran it for tonight). They were extremely lucky. The BBEG's tactics work, but they take a while. This gives your players a brief opportunity to accomplish the goal. In the surprise round, she attacks. In the next round, she can draw a weapon as a move action and begin the full-round action from her Tactics entry as a standard action. For her standard action on the second round she can complete this action. So the players should have a chance to accomplish the goal, especially if they do something smart. But that is perfectly fine, I think. The scenario is not particularly dangerous, but it is difficult to accomplish both goals. I think there should be more PFS scenarios that work this way. The group I ran tonight all got knocked out from non-lethal damage in the second combat encounter. They had to explain themselves to Boss Croat, what they were doing in Riddleport, and why were they disrupting his racket. They were able to successfully bribe him to let them go. It was a great Godfather scene! That was the most dangerous encounter for this group. I think this is a tough scenario to run well. So I am only giving it three stars. Otherwise it would be a 4-star scenario. Played this at low tier. To start with it is a nice scenario with some good roleplay to kick it off. The fights were suitable and fun. What screwed this scenario was the final encounter. Unless the party are incredibly lucky or can kill the main villain in one round the scenario fails. It fails because it sets up a action that can't be done. Although we enjoyed playing the first part of the scenario I think everyone walked away at the end just a bit PO by the ending. This scenario promises a dangerous plot of deception, which likely is Cyphergate related. Like others have pointed out, you are left to expect cyphermages and tough diplomatic choices, with some puzzlesolving along the way. I'm sorry to say that if you are going to play this scenario with those expectations, you'll be disappointed. What's worse, in my opinion at least, is that the storyline is simply lacking. To me it seemed as if the writer thought of some interesting encounters and just threw them all together. They're not really linked story-wise and it is the GM's job to somehow make it seem like a logical and plausible progression. It is doable, but it shouldn't have been left to the GM's imagination. Mind you, my GM did a great job regardless. If anything this lack of logical storyline made it hard for us a party to follow the path the scenario wants you to take. Instead of going from A to B to C to D to E, my party went from A to C to a made-up, yet perfectly logical F to D. This means that the scenario is flexible, but does need a GM who is flexible and who can improvise well. The fights in this scenario are okay. It's nothing special to be frank. I do however have a problem with the final fight. Where you would normally expect an epic showdown of sorts, this one can actually be completely lacklustre. Don't get me wrong though. The premise is really great and in theory could be pretty epic, but it's almost too easy to defuse the situation. I could elaborate more, but Ascalaphus summed it up below in such a way that I don't see a reason to echo his sentiments. As it stands, we solved the situation with a single spell and with that the fight was already over. I believe two people didn't even get to act in that 'fight'. You could say we were lucky, but we really weren't in my opinion. As a result that final showdown was pretty disappointing and left me as a player wondering if that was really the end of the scenario. Looking back, I'm still not really satisfied with how the scenario ends, but I want to stress the fact it's not the GM's fault, but rather a problem that lies at core of the scenario itself. Feats: Cypher Magic (Inner Sea World Guide 284), Scribe Scroll. So basically any cyphermage is a level 6+ spellcaster, probably a wizard. The head of their order is a level 9 diviner (according to Second Darkness). If there's NPCs with this prestige class anywhere in the world, it's gonna be in this city, their headquarters. And divination is basically their thing. But they need the help of some level 1-5 pathfinders, because their organization is under attack and they don't know where it's coming from. Next, there's people walking around with rabid dogs as pets. She's a pirate who wants to compete with said level 9 NPC. Except that she's level 2 or 5 magus. She wants to become more notorious and feared. The warehouse where she stores her loot in the harbor is known; people have seen her crew bring stuff to it. However, the name of her ship is a secret. It's right there in the harbor, but it's a secret. Meanwhile her crew is going to and fro it. 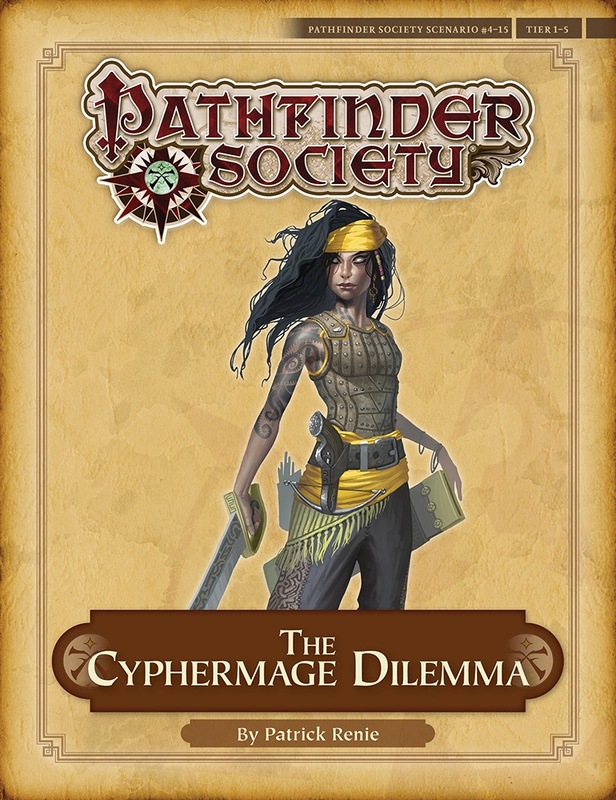 "Cyphermage Dilemma" makes you expect cyphermages, as well as tough choices. Maybe some puzzles, some magic/rune stuff. Well, disappointing. The story is a railroad. The fights would be easy for a fresh level 1 party; our four-person 1/2/2/2 party sleepwalked through them. (Merisiel 1; fairly mediocre level 2 gunslinger; level 2 support cleric and level 2 arcanist that never even cast a level 1 spell, there was no need. Basically, Merisiel beat people up and took their lunch money with some flank buddy help.) Supposedly the enemies are exotic races and exciting classes. In practice they're low level and die before doing anything special. There's some implied intrigue but you're basically brought in to do the mopping-up so it doesn't apply to you. The BBEG's plan is to hold hostage the guy you've been sent to rescue. She threatens to Coup de Grace him if you attack. I was coming down with a cold and half asleep and accidentally fouled things up, so he died. And one round later the BBEG died as well, never even having damaged us. This scene could've been something. Bad guy holds scholar hostage, you're trying negotiate something. Maneuverings, you try to somehow set things up so you can save him. But the practical solution is to just kill her in one combat round, because her tactics specifically call for a Coup de Grace, which as a full-round action can't be readied. You'd want to make sure the entire party is in melee range before you strike. But she wants to march out the guy at swordpoint, so she does this for you. The point I'm trying to make is this: this is supposed to be the big scene. Either you have a tense hostage negotiation, or you have an epic fight against a weird and special combatant. But then the author should've written down some actual ideas about how to negotiate with her; as is there's little to negotiate about. If you let her leave you fail the mission. And she's rather uncompromising. And the fight.. well, she's just too squishy for that, and she's scripted to waste a round on killing the hostage. No chance in combat. It would've been better to omit any reference to cyphermages. Call it "carefully beat up the BBEG at the end of the railroad" and it'd be better, because you're not raising expectations. If one has played the Exclusive already, does that mean they can not play the new revised Season Four? Correct. You can only have one Chronicle sheet per adventure as a player and one as a GM. I'm not seeing a date when this scenario will be available to purchase? Could I get someone to comment on when it will be available for purchase and download? Tarrintino, your question was answered in the product discussion for #4-13 here. Just to make this visible here, apparently it's supposed to be released on the 27th. I was hoping to use the special promo for this today. Just wondering when it will be available. If I have the 4 Star Special version of this do I have to buy this version or is my old version updated? You should get the old version updated. I'll see what we need to do to make that happen tomorrow. The older version of this scenario has been added to the download package. Mark any changes from the Exclusive version? Or is it only just layout changes? There are editorial changes throughout. The "GameMastery Map Pack: Boats & Ships" is out-of-print. Offering it as a PDF means simply extracting the image out of the PDF and using *THAT*. I'd rather buy the print version if you folks would be so kind as to keep it in print. 1) Links to where you sell the product suggested within the PDF, making it trivial to GET to them. 2) Putting a 'vote for re-runs' or some sort of 'put your money where your mouth is' thing on out-of-print maps. I'm new at this, so I don't have the huge collection of stuff and I'll have to get it over time. If you were to publish a bunch of stuff calling for a map pack you no longer offer in print, that would be silly. Find some way to see what demand there is for another run of the product and offer it if you can find the demand to put it back on the store. 3) Revise your Cyphermage PDF to suit the "Cabins" product you *DO* offer. I'm ready with money, and I find it annoying I can't buy what CyperMage Dilemma suggests I use.